Spring is on the way so I thought I would share an Easter themed project. 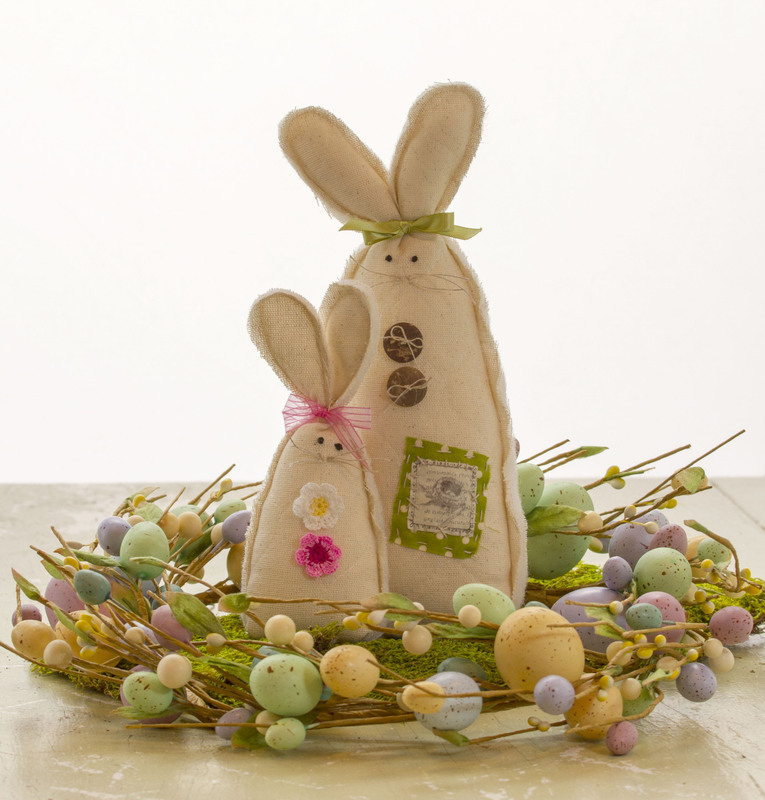 These bunnies are easy to make and embellish how you would like. 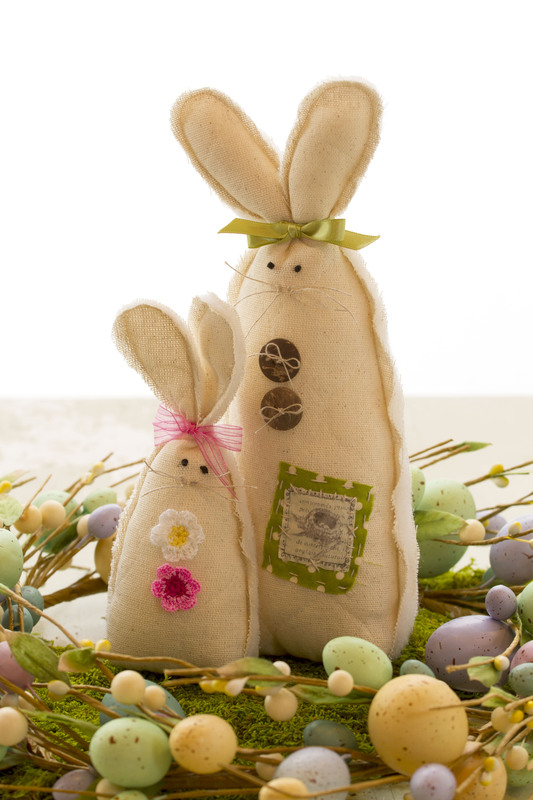 I used unbleached quilted Osnaburg fabric for these bunnies although muslin, cottons, burlap, or other fabrics would work as well. I drew a pattern on paper and folded it in half lengthwise and cut it out so both sides would match. Now that I had a paper bunny shaped pattern I traced the pattern on the right side of the fabric. I then sewed the eyes with french knots and added patches, buttons, or other decorative details on the top layer. Then I put the fabric I just embellished on top of another piece of quilted Osnaburg (wrong sides together) and pinned outside the drawn pattern lines. Leaving the bottom open I sewed on the lines and then cut the bunny out leaving a small seam allowance of about a 1/4 inch. I stuffed the large bunny ears and left the small bunny ears as they were. Stuff the bunny body until there is about an inch of fabric left on the bottom. Fold up the bottom as if wrapping a present and sew or glue closed. Knot thread a little ways from the end of the thread and stitch whiskers. Knot the other side where the needle comes out. Finish making the rest of the whiskers. I added a tail by cutting a circle and hand stitching around the outside and gathered slightly. 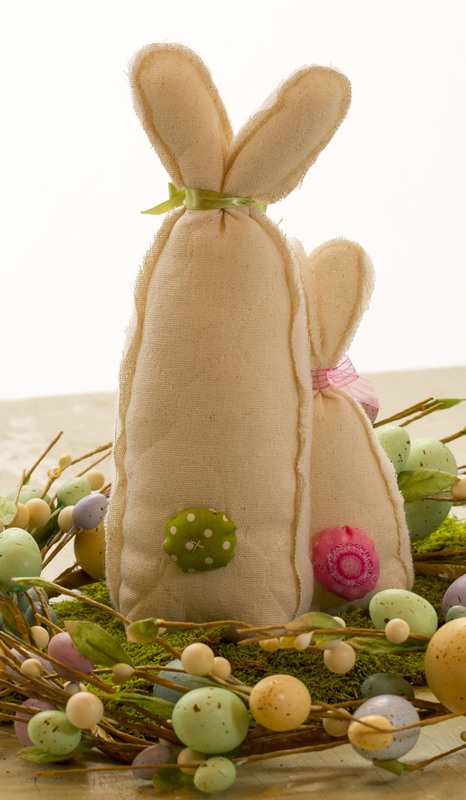 Then add stuffing and pull the gathering threads tight and sew on the bunny. Glue or sew the two bunnies together. If you would like me to add the pattern I drew for this project please let me know. The pattern could be a short chunky bunny or a tall thin bunny. You could make a large family of bunnies or just one. It is entirely up to the individual. This is a fun project to dress up your home for the holiday. 06 Mar	This entry was published on March 6, 2014 at 12:39 am. It’s filed under DIY, Holidays at the Cottage, Tutorials and tagged bunny, decor, decorating, DIY, Easter, rabbits, sewing, spring. Bookmark the permalink. Follow any comments here with the RSS feed for this post. Thank you! I may leave them out year round? Thank you! Can’t wait for spring! I like those because they look quick and easy. Thanks for sharing.